After the success of Z6 now Qmobile introduced Qmobile Z7 which has more features and slim body as compared to Qmobile Z6. 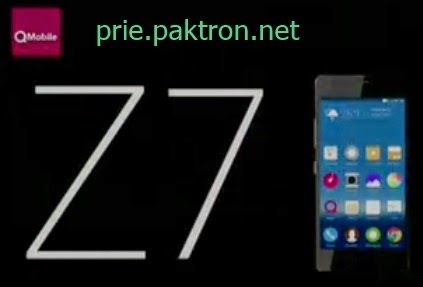 Qmobile Z7 is the complete smartphone it has limitless home screen which manage users data and apps Qmobile Z7 ability of Independent AE and AF Lock. QAmigo 2.0 OS, Android OS, version 4.4.2 (Kit-Kat), 1.7 GHz Octa core Cortex-A7 Processor with Mediatek MT6592 and GPU: Mali-450, 16 GB built-in storage so no need of extra memory, 1 GB RAM, Talk time Up to 10 hours, 4.8 inches screen with 720 x 1280 pixels(AMOLED capacitive touchscreen, 16 Million colors, Multi-touch, Corning Gorilla Glass 3) Stand-by Up to 4-5 days on 2050 mAh powerful battery, Bluetooth 4.0 with A2DP, USB, WLAN, GPRS, EDGE, 3G, FM Radio, Audio/Video Player, GPS + A-GPS support and many other apps and games. 8 Mega-Pixel rear camera with 3264 x 2448 pixels size and features: Auto focus, LED flash, Geo-tagging, touch focus, face smile detection, panorama, HDR, Video 1080 pixel @30fps and found 5 Mega-Pixel Front Camera.